Wright State will become part of a national program designed to prepare and sharpen the focus of college undergraduates to become future leaders with deeper and broader understanding of how to address challenges of the 21st century — from clean water to cyberspace security. The university was notified in November by the National Academy of Engineering that it was officially approved as a Grand Challenges Scholars Program school. “This will put us on the map,” said Sharmila M. Mukhopadhyay, who will direct the Wright State program. Mukhopadhyay is professor of mechanical and materials engineering in the College of Engineering and Computer Science and director of the Center for Nanoscale Multifunctional Materials. Mukhopadhyay proposed the program for Wright State after returning from a stint in Washington, D.C., where she served as a Jefferson Science Fellow of The National Academies of Science, Engineering and Medicine. Grand Challenges was launched in 2008 by three universities and has since grown to about 150 around the world. It is a combined curricular, co-curricular and extra-curricular program with five competencies — research and creativity, multidisciplinary, business and entrepreneurship, multicultural, and social consciousness. 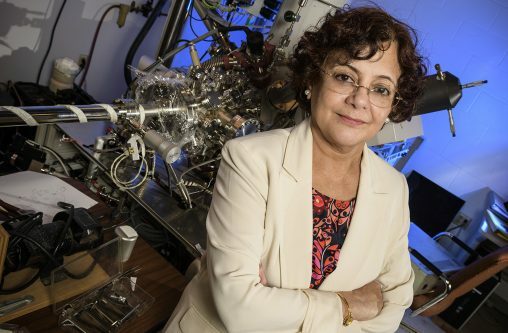 Mukhopadhyay connected with the Grand Challenges program and its leaders while serving as senior scientific adviser at the State Department as part of her Jefferson Science Fellowship. She visited a large number of governmental and diplomatic agencies, research laboratories and top universities to create linkages between emerging technical innovations and inter-governmental as well as academic policies. engineering the tools of scientific discovery to understand the many unanswered questions of nature. Mukhopadhyay said engineers and scientists have always been trained in technical things but often have had to pick up leadership skills along the way, something the Grand Challenges program will help provide from the start. Today, she said, engineers and scientists can no longer solve the complex and multifaceted challenges of the 21st century in the isolation of their own comfort zone. They need multidisciplinary and business skills, a global perspective, multicultural understanding and social consciousness. Mukhopadhyay said the Grand Challenges pathway will be incorporated into Wright State’s curriculum. The program begins spring semester, is open for application by any undergraduate and will start slowly, with 10 or 15 selected students. Students select one of the 14 Grand Challenges topics to focus on. Each student will have a faculty mentor and adviser to guide them, who will help them develop their portfolio through a variety of coursework and experiential learning options. While taking the general education and breadth courses required for their degrees, the students will select courses relevant to their topics and connect them in their portfolio. Students must also take capstone design, research, experiential learning and service learning experiences that are connected to their selected topic. The students who complete successful portfolios will graduate with a special honor, certified as Grand Challenge Scholars by the National Academy of Engineering. Mukhopadhyay believes the program will produce a more responsible, mature and forward-thinking cohort of graduates. “We have many students who could potentially become world-class leaders, and now we have an avenue to cultivate that acumen,” she said.